This is Kömbe a börek that is made in a baking tray. 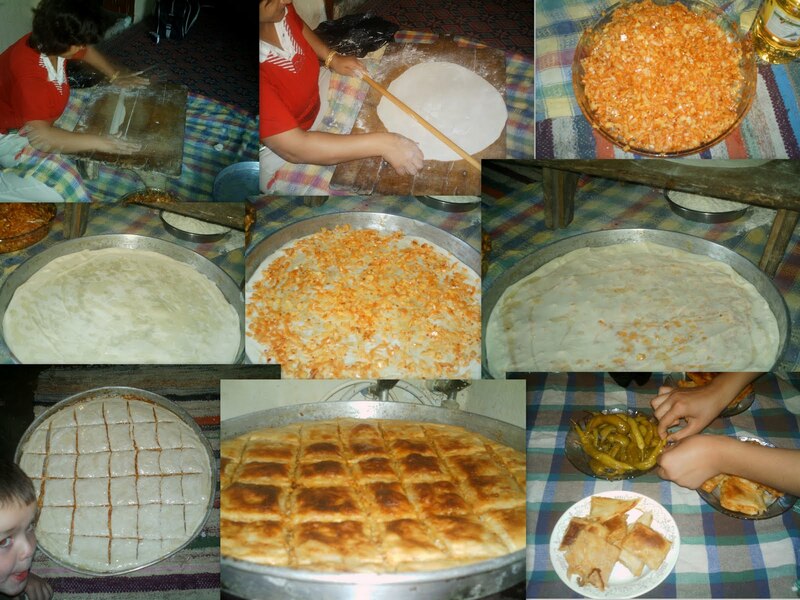 It is made up of thin yufka(phyllo)sheets with filling and layered. Usually anything from 9 to 12 layers. The more sheets it has the more the neighbours are impressed. It has a base of 2 sheets, some women put 3. Then a layer of filling then another 2 sheets. Between the pastry sheets you need to sprinkle or brush on some oil. This makes the pastry sheets puff up. Now if you make the sheets yourself as my other sister inlaw is doing and they are nice and thin like hers you have to use 2. If your not that great at making the sheets and they are a bit thick use one on the base. The pastry sheets and filling are all layered until you have your desired amount of layers. The mixture you can see is onion and potato with a bit of sweet pepper paste(tomato paste can be substituted). It wasnt cut that well but thank goodness that dosnt affect the taste. It is baked quickly in a hot oven until nice and brown. Easy meal usually eaten with pickles and ayran. If you are not a Turkish housewife and dont want to make the yufka sheets yourself you can easily make this at home using phyllo pastry sheets instead. Grate the potato and thinly slice the onions, mix well. Add in the salt and pepper paste and mix well again. Depending on the size of your tray and how many layers you want to make depends on how many sheets you will use. Phyllo is fairly thing so I would be putting 3 sheets down the bottom of your pan. Oil your pan well. Start by layering the pastry and potato filling - pastry (3) - potato - pastry 2 - potato etc until you have the desired amount of layers. An important thing to remember is that less is more when it comes to the filling. You have alot of layers so you dont want to overfill. The thinner the final product is the nicer it is especially if you are generous with the oil the whole thing almost becomes fried. If you dont want a fried end product use less oil and the börek is nice and light. Cook in a very hot oven until the top is a nice brown. Some people put egg on the top, some use oil and some use a mixture of oil and yogurt(this makes the börek nice and soft). A good tip is after it comes out of the oven and is piping hot sprinkle on some water then place a tea towel on top. This makes it softer. If you want fried and crispy skip the water. Well, Simcha if it mean't impressing my PINK house neighbours I'd use 33 sheets instead of 3 LOL! Do you remember my neighbours from hell?? Sounds delicio anyway. I'm always up for impressing the neighbours! I like the great big pan it's made in too. Yes I remember them well :)your impressive in your own rights do you really need 33 sheets? My sister inlaw made 2 large pans of this borek and it all disappeared.